On 24 October Inspector Danny Butler, from the Hammersmith division of the Metropolitan Mounted Police, gave us a fascinating insight into the selection, training and deployment of police horses. We see them walking peacefully through Holland Park and find it hard to imagine how skilled and courageous they are in their real role in crowd management. And that is just the horses. Those who ride the horses: policemen, and increasingly policewomen, undergo equally tough training and can find themselves in the front line when hostile crowds are intent on trouble. They helped keep us safe during the Olympics and regularly do so at football matches. Inspector Butler had many surprising stories to tell, including a reminiscence about a race horse recruited into the police team. He remembered seeing his senior officer disappearing up Caledonian Road at a hectic and undignified speed and thinking he was not going to stop before Hendon. We were told that the police look for horses from many backgrounds but they must be able to tolerate considerable weight because a mounted policeman, fully clad in riot gear, might weigh up to 18 stone. He also used some distinctly unhorsy terms, like looking for ‘low mileage’ in a candidate horse. Next time you see the Met horses in Holland Park, enjoy their presence as ever, but give both horses and riders even more respect for their bravery; and a wave – it might be Danny. Our picture shows Inspector Butler putting a horse through its paces. The horse, effectively seeing a wall, would need to trust its rider completely. Barely two weeks to go before our most popular event of the year when we welcome The Tallis Chamber Choir and their musical director Philip Simms to the Orangery to sing carols interspersed with seasonal readings. The evening ends with wine and Janice Miles’ mouth-watering canapés. If you have not already booked we urge you not to hesitate: the tickets just fly off Rhoddy’s desk. Please use the order form which can be downloaded here. We are pleased to announce that Natalia Lomeiko has promised that she and her friends will play for us again on the last Saturday of the Art Exhibition, 12 April, at 7.30pm in the Orangery. Details of the programme will be in the spring newsletter but those who know the verve and passion with which they play will need no urging to put the date in their diaries now. We are extremely fortunate to have such consummate professionals perform in the Orangery. It will not have escaped your notice that something big has been going on just south of the park on the old Commonwealth Institute site. The Design Museum, currently at Shad Thames, will open in the iconic building, but not until the end of 2015. 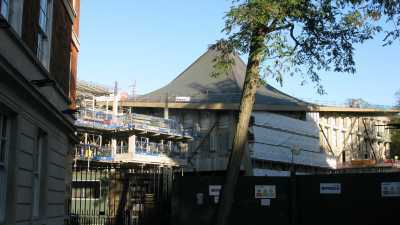 We thought you would like an update on the development: what has been involved in restoring the paraboloid roof and the blue glazed walls, as well as what we can expect the whole residential development to look like when finished. Our speaker is Sir Stuart Lipton, co-founder of Chelsfield, the company developing the site. As we get nearer to the opening in 2015 we hope to invite someone from the Design Museum to show us what will happen inside the extraordinary building and how the Museum will operate. Tickets are £12, to include wine and Janice Miles’ delicious canapés. To order tickets please download the order form. 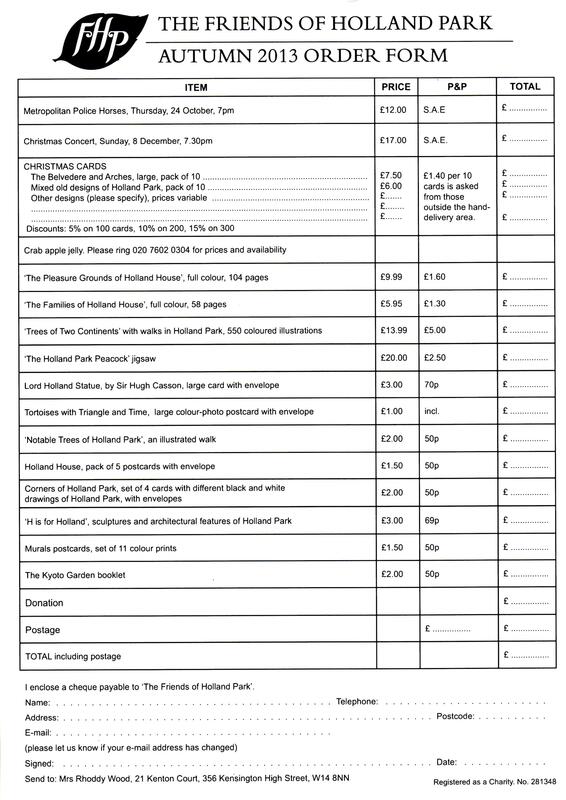 The Friends of Holland Park is a registered charity, formed in 1978. We work hard to protect and preserve the Park as an oasis of tranquillity, natural beauty and recreation, guarding its unique character, monitoring planning applications and proposed changes in and around the Park. We currently have around 1,000 members. We are looking for a motivated individual to act as our Assistant Treasurer. This entails managing our day to day banking and maintaining some of our accounting records. There are likely to be other opportunities for getting involved in the running and supporting the charity. The Treasurer has overall responsibility to oversee the financial matters of the charity, and reports at regular intervals to the Board of Trustees about the financial health of the organisation. You will work closely with the Treasurer to ensure the sound financial management of the charity. Workload of the Assistant Treasurer will vary month to month, averaging around 1 to 2 days over the course of a month. Peak activity is in the period December to January and when we run events, approximately once a quarter. If you are a whiz with figures, have an eye for detail and enjoy record keeping then this role is for you. You are comfortable working with computers, especially excel, and ideally familiar with basic book-keeping. You take an interest in Holland Park and the work of our charity, and are based in West London ideally within walking distance of the park. We are very grateful to all our members without whom there would be no Friends. It is your impressive numbers (nearly a thousand) which give us influence among the councillors who make policy, and ensure that we are at least listened to if not always agreed with. We hope you will all want to renew. 1 September have their membership valid for 2014. Well over half of you have also signed Gift Aid forms, which means that the Friends can reclaim 20p in the pound from HM Revenue & Customs, and this adds up to over £1,000 a year. If you found a Gift Aid form with your newsletter please sign and return it if you pay UK tax. If you do not pay tax and tell us, we will try to ensure that we do not ask again. Thank you. The Friends’ Annual General Meeting is your chance to hear what your committee has been doing on your behalf and what it plans to do for the rest of the year. Equally it is your opportunity to tell us your views on the committee’s work, and what concerns you have about the park that you would like us to address. The meeting will again be chaired by our distinguished president, Sir Angus Stirling. This has been my first year as chairman, and it is proving a busy one. We co-opted a new treasurer, Madeline Denmead, in April this year and need your formal approval at the AGM for her to continue her work as a trustee. We have been in serious dialogue with the Council about the impact of the Opera on Holland House and its visual impact on the surrounding areas of the park. Planning permission for 2014 is likely to have been agreed by the time of the AGM, but there is the possibility of greater improvements for 2015 and beyond, and our AGM will be a timely opportunity to share views. As the bi-borough amalgamation continues, department by department, our key contacts are changing and we are working hard to make sure we understand their agendas and they understand ours. While all this happens the park gets ever busier and will continue to do so as The Design Museum opens at the end of 2015, and as big local developments start to be inhabited. The Friends need to work with the Council on how best to protect our fragile asset. It looks like another busy year ahead. We need your support so we hope we can count on you to join us on Wednesday 9 April. Indeed, we are always keen to recruit new members to help us year round with the work of the committee. Most of you know that the AGM takes place during our annual art exhibition in the Orangery. After the AGM you can enjoy the paintings and other exhibits and discuss them over a glass of wine, or buy one you really like. All FHP events in the diary are printed in bold. The Friends are determined that our Bird and Nature Walks (BNW) will continue although, sadly, Ian Thomson is no longer with us. While we look for a permanent leader with the requisite skills and commitment, the walks will be led by varying regulars. We will have strolls through the park looking at birds, plants, butterflies and park management of current interest. There is no charge and all are welcome without booking. Note one change: meet outside the café at 9am on the first Saturday of each month. No dogs, please, as even well behaved ones on leads disturb the wildlife. We recommend you bring binoculars if you can. Events organised by the Ecology Service of RBK&C are listed as ‘ES’, some of which are sponsored by FHP where indicated. Unless otherwise stated the meeting place is in the new Ecology Centre near the Adventure Playground. Some must be booked, in which case please call 020 7938 8186 or e-mail ecology.centre@rbkc.gov.uk. There is a charge for those marked £. Sun 8 Dec Christmas Concert: Tallis Chamber Choir, 7.30pm in the Orangery, £17. Sat 22 Feb Moss Walk with Alan Harrington, Stable Yard, 11am-1pm. Must book on 020 7602 0304. At the end of 2013 the Council will be lodging a planning application for the 2014 opera season’s temporary structures around Holland House. You will remember that The Friends succeeded in reducing the time the canopy is in place to 6½ months from the 12, then 8, months applied for. Since that time, FHP has been in dialogue with the Council to explore both whether the 6½ months can be reduced to our preferred 5 months, and also what options exist for reducing the impact of the opera’s ancillary buildings. English Heritage is supporting the discussion in line with their published view on consideration for the setting of a Grade 1 listed building. We hope to update you before the planning application is lodged. The Friends are not against the opera itself but wish to see its impact on the park significantly reduced. 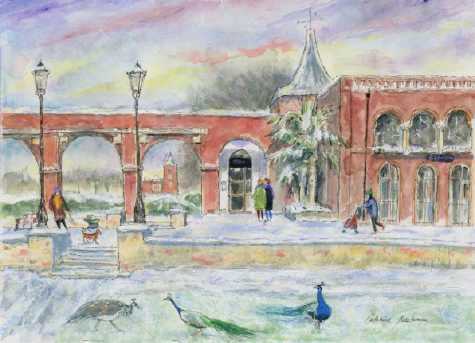 This year’s new card is painted by Catherine Masterman who last year produced the highly successful card showing the front of Holland House as seen when the opera buildings are not erected. Now we have a view of the Belvedere with the adjacent arches framing a distant view of the tower of Holland House. We will also be selling mixed packs of old designs, at a reduced price (£6 instead of £7.50 for 10) which are always popular. Typically these will contain one small card (98 x 152 mm) and nine large (152 x 197mm) in three different designs. Supplies are limited and you are advised to order early though there might be some extra with less variety. There is also a large choice of London views in the brochure and an even wider selection on the website (www.mbcards.co.uk). If you use the Order Form, which may be downloaded here,the minimum order is 10 cards, and we will deliver free within our newsletter hand-delivery area, but have to charge postage of £1.40 per 10 cards beyond that. If you order from Mountbatten Cards directly, delivery is free to most West and Central London postcodes but is £5 if outside that area, or the order is for less than £30. Overprinted cards must be ordered from Mountbatten. In either case envelopes are included, and there are discounts of 5% on 100 cards, 10% on 200 and 15% on 300. We hope that you will all nominate FHP as the recipient of the charity donation from Mountbatten of 25% of the profits but you are free to choose any charity. • The Friends donated £2,700 for seven picnic tables now located at the south-east corner of the sports ground, a site which allows visitors to view the Commonwealth Copse of interesting trees. • We found a company that makes gates that are both robust and attractive and, jointly with the park’s Ecology team, have briefed them to create a design for a pair of gates that will prevent unauthorised access to the Wildlife Enclosure. The bottom part of the gate will be panelled in oak, while the top will be inset with metal filigree work depicting birds, plants and small mammals – those regularly seen in the enclosure. Such beautiful gates will not be cheap, but this is a good use of The Friends’ funds as they will be expertly crafted and should last for many years. • The new Ecology Centre alongside the Adventure Playground opened on 19 September with appropriate features such as a compacted mud wall and larch cladding. It offers greatly improved facilities for teaching, a reception area and open space to promote awareness and understanding of biodiversity. Toilets, accessible by all users of the playground, will be included – something the Friends have been asking for over several years. • Investigations have re-opened into whether there is an affordable way of adding a sound baffle to the ceiling of the Holland Park café so that one can enjoy a cup of coffee and be able to hear what one’s companions have to say. • The Friends and the Borough have continued discussions with the developers of The Design Museum in the old Commonwealth Institute building. At some point our iconic 18th-century French iron gates at the Earls Court Road exit will disappear to be conserved, and the leaf detail that has broken off will be replaced. This expert work will be funded by an agreement between the park and the developers. • After receiving many complaints, the park’s management built a York-stone path across the North Lawn to cross the winter mire created by a previously undiscovered spring. You might have thought the gaps needed weeding but the little plants are in fact fragrant herbs which will grow to release their scent as people walk or wheel pushchairs over them. On 10 July, under a cloudless sky and surrounded by lovely trees, flowers, and in the company of a white duck and a moorhen, we enjoyed our first dry Pimm’s party for three years (dry as far as the weather was concerned). We were again in the garden of the youth hostel, by kind permission of manager Sally Martyn-Johns. Occasionally the music of Donizetti drifted across from an opera rehearsal to add atmosphere to the proceedings. We were delighted to welcome what must have been a record number of special guests: the Mayor, Charles Williams, Councillors Tim Ahern, Deborah Collinson, Rock Feilding-Mellen, Warwick Lightfoot, Marie-Therese Rossi, as well as Barrie Maclaurin (Parks Manager), Inspector Mike Rumble (Parks Police), Ben Binnell (Quadron Manager) and Leanne Brisland (Ecology Centre Manager). Once again the Friends’ trustees had been busy in the hostel kitchen preparing the Pimm’s, and Jackie’s ample canapés must have filled with regret those who were going on to dinner. Tickets are £12 and s.a.e. including wine and Janice Miles’ delicious canapés, using the Order Form which may be downloaded here. The Mounted Police, formed in 1760, is the oldest part of the Metropolitan Police, but duties and training have changed enormously in 250 years. Finding the right temperament in a horse and then carrying out training for each individual animal is a rigorous process. 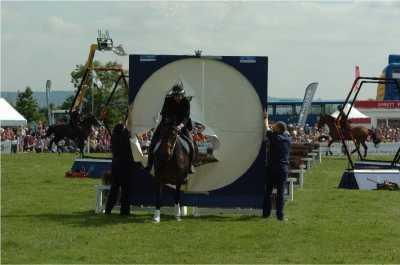 Once ready for action, the horse needs to be capable of performing in many challenging situations, often with large crowds. The story of the Met’s mounted division is fascinating. They no longer have to deal with highwaymen but they do play an important role in managing football crowds. Our speaker, Inspector Danny Butler of the Hammersmith Division, has experience in many aspects of what is involved in making sure these wonderful horses help to keep our borough safe. From training at Imber Court to deployment of the animals on active duty, Insp. Butler has plenty of tales to tell and is very happy to answer your questions. 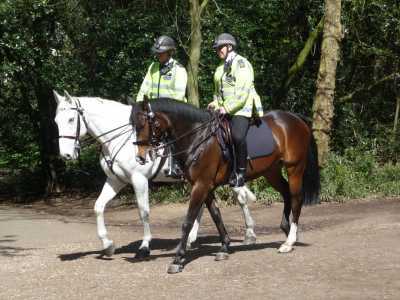 He has also worked as part of the Notting Hill team, so knows Holland Park well and confirms that both horses and police love their rides through our park. Ian Thomson, who died on 26 June, joined the Friends of Holland Park in 1983 and was elected a trustee in 1988. A year later he became Secretary. His duties as such were mainly to take minutes of Committee meetings but he did much more. He was essentially a practical man and was keen to use the resources that he controlled as manager of an upmarket block of flats for the benefit of the Friends. His cavernous basements were at our service for storage of boxes of literature which was much appreciated by the rest of the trustees who had only limited space in their own dwellings. He also organised reliable craftsmen who had worked for him and who designed and built stands and screens which we still use annually for the Friends’ art exhibition. Ian’s love of Holland Park was founded on his enthusiasm for its birds. He came to know us through his attendance at monthly bird walks led by experienced RSPB members who had been found by the Friends. When in 1992 the second of these moved out of London, Ian took over the leading. He was well qualified to do this having the sharpest of eyes to spot avian movement and the ability to show others where it was. In 1992, Ian moved to Scotland to look after an elderly relative and we thought sadly that we had lost him. Within a couple of months however the relative died and luckily Ian had not sold his London flat so was able to return to it. By then we had found another Secretary but were delighted to welcome Ian back as Bird Walk Leader which he continued to be for over twenty years. He was allowed August off but otherwise hardly missed a walk, 11 months a year, in all that time. For two or three years we gave him a dozen bottles of wine at Christmas as a thank you, but then he asked us to stop as he did not want to be further rewarded for what he enjoyed doing. One of Ian’s most endearing qualities was that, however long he had been leading the walks, his enjoyment of the birds of the park remained undiminished. In November last year, on the monthly walk, he was thrilled to spot a tree creeper, the first to be seen in the park for many years. He was delighted to be able to share his pleasure with the group he was leading. One of our members, who had only previously known a wren from a farthing coin – the price of a gob stopper in his youth – was delighted to discover, when he came on one of Ian’s early walks, that the bird was real, was plentiful in Holland Park and could be identified by its song even when invisible. That member became one of Ian’s most regular followers. Ian only resigned from leading three weeks before his death and even then gave us to think that it was because of Helen’s needs rather than his own. A whole generation of bird watchers are grateful to him for his commitment and the pleasure he brought us. R.I.P. Sunday, 8 December is definitely a date for your diary, as this is when we will again be welcoming the Tallis Chamber Choir and their musical director Philip Simms for their annual carol concert in the Orangery at 7.30pm. As always we advise early booking as the concert is usually sold out. Tickets are £17, to include wine and canapés, and these can be obtained by downloading the Order Form. All FHP events in the diary are printed in bold. The Friends are determined that our Bird and Nature Walks (BNW) will continue although, sadly, Ian Thomson is no longer with us. While we look for a permanent leader with the requisite skills and commitment, the walks will be led by varying regulars. We will have strolls through the park looking at birds, plants, butterflies and park management of current interest. There is no charge and all are welcome without booking. Meet at Lord Holland’s statue at 9am on the first Saturday of each month. No dogs, please, as even well behaved ones on leads disturb the wildlife. We recommend you bring binoculars if you can. We are delighted that Jennie Kettlewell was elected as our new chairman at our AGM. Jennie has lived in Holland Park for 30 years, been an FHP member for many years and served on the committee since September 2011. She is very familiar with the park, its assets and particularly its plants. Her career has involved much that is relevant to The Friends committee: working with boards to determine their strategic priorities, advising clients on managing organisational reputation, culture change programmes and development of individuals and teams especially relating to productive leadership. She is an interviewer for the Institute of Directors Chartered Director programme, through which she builds knowledge of what organisations do that makes them successful. 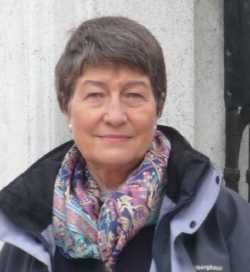 Madeline Denmead has been co-opted onto the committee as treasurer and we are not only delighted to have found someone to replace Carron Batt so speedily but count ourselves fortunate that Madeline is so well qualified for the role and also interested in the broader remit of The Friends. Carron Batt resigned in March due to frequent absence abroad and we thank her for all she has done during her time as treasurer. We were delighted once again to welcome the Russian Virtuosi of Europe on 23 March, led by our old friends Natalia Lomeiko and Yuri Zhislin, together with the British cellist Richard Harwood. There were some empty seats in the Orangery, but the absentees missed an inspiring and most entertaining evening. The first half of the concert comprised Beethoven’s String Trio in G, Op. 9, No.1, composed in 1897, when Beethoven was 27. The three string trios Opus 9 were the last that he wrote before turning to the string quartet. The G major trio is all light and joy. The mood of the first movement is overall calm and features little conflict. The second movement is generally serene and conveys an atmosphere of dreaminess. The third movement has an unusual structure with the trio section repeated four times. The finale is a lively and colourful presto. This trio is a remarkable work, which it is thought was nearly the landmark in chamber music that Beethoven’s third symphony, The Eroica, was in the symphony genre. One wonders what was the reaction of those who first heard it. The work in the second half was the Sonata for Two Violins in A minor composed in 1915 by Eugene Ysaye (1858-1931), a Belgian violinist, composer and conductor, and dedicated to Queen Elisabeth of Belgium, who was one of his pupils. Yuri told us that Ysaye had intended that the Queen should perform in the piece, but unfortunately it proved too difficult for her. Ysaye was the most celebrated violinist of his time. However, in his early career he was leader of the Benjamin Bilse Orchestra in Berlin, later to become known as the Berlin Philharmonic Orchestra, and from 1918 to 1922 he was music director of the Cincinnati Symphony Orchestra. During his career he composed a large number of chamber works and works for violin and orchestra as well as one complete and one uncompleted opera. The sonata shows influences of many different styles with echoes of Debussy and Ravel and even early Schoenberg, and translates Ysaye’s great knowledge of the violin’s capabilities into thrilling music. The first movement is dramatic and more or less in traditional sonata form, whilst the second movement is more rhapsodic with the main theme reappearing in different versions throughout the movement. The lively, and technically demanding, third movement is similar to a classical rondo. Both works were performed with great musicianship and technical brilliance and we should feel privileged that such exceptional musicians should be willing to come and perform for us. All FHP events in the diary are printed in bold. Our bird/nature walks (BNW) will continue to take place on the first Saturday of each month. Sadly, we heard just before going to press that Ian Thomson, who has led these walks for about 20 years, has had to retire for personal reasons. We are most grateful to him for his long service, and will have more to say about this in the next issue. We have agreed that we will continue to meet each month and, until we can find another permanent bird leader, whoever is present, willing and most knowledgeable, will help the rest of us to see the birds. Discussion of the plants we pass and any new activities in the park will continue as before. Meet at Lord Holland’s statue at 9am. The walks are free and everyone is welcome, not just members, so please come and encourage your friends: they might become members too. We recommend you bring binoculars if you can – they make such a difference. Wed 10 July Pimm’s in the Park. In the youth hostel garden, £12 6-8pm. Members only. On 8 September you will have another opportunity to visit the youth hostel garden, normally not accessible to the public. The hostel is again holding a YHA Open Day in the garden; there will be stalls with information and refreshments. We look forward to seeing you at our annual summer party in the lovely garden between the east wing of Holland House and the youth hostel. The hostel’s manager, Sally Martyn-Johns, is again kindly allowing us to hold the party there, and we have chosen an evening when we will not have to compete with an opera performance. This event is only open to Friends and their immediate guests. We also like to invite a few special guests to thank them for their work in making the park such a pleasure to be in. We are delighted that the new RBK&C Mayor, Charles Williams, has said he will be coming to the party, as has Tim Ahern, the newly-appointed RBK&C cabinet member responsible for Environment and Leisure. Please book your tickets, at £12 each, to include Pimm’s and light refreshments, on the downloadable order form. Annual General Meeting The Annual General Meeting was held on 20 March 2013 in The Orangery. The President, Sir Angus Stirling, welcomed all those present. Apologies were accepted from Carron Batt, Mary Lambert and George Law. The minutes of the previous AGM were approved. Sir Angus explained that, following the resignation of Stewart Katz, Jennie Kettlewell would stand for the post of Chairman. He thanked Nicholas Hopkins for the leadership he had shown during a difficult time without a Chairman. Andy Walker delivered the report for 2012 on behalf of the trustees. She said. The Friends had sponsored several Ecology Centre events, had donated two stone seats for chess players, hosted two talks and published two books - The Families of Holland House and The Pleasure Grounds of Holland House. The 30th Art Exhibition under the new and creative management of Gordon French turned in a profit of £1,500. Grateful thanks were conveyed to Ian Thompson, George Law and Janice Miles for their services to The Friends during the year. Transition to unified teams across Kensington, Chelsea, Hammersmith and Fulham had affected both parks management and parks police. The Friends’ vigorous campaign of objection to application for the opera canopy to be in place all year, resulted in a withdrawal of the application. Work progressed on the old Commonwealth Institute site and residential redevelopment will start shortly on the Holland Park School’s old playground site. The YHA relinquished its long-term lease on the park hostel and will lease the hostel from RBKC for another five years, after which the Borough will find a new use for it. A set of 2012 accounts was available to all. Jennie Kettlewell, on behalf of the Treasurer, pointed out the unusually high assets due to a legacy of £25k, and the extraordinary item which was explained by Nicholas Hopkins as a bad debt by the maker of the wave benches. The Secretary, Mrs Rhoddy Wood, presented her report, saying there were 807 paid up members and around 180 might still renew. In spite of the 96 new members, a transient local population means we need to replace around 20% of the membership each year so she urged all to help to secure new members. Mrs Wood thanked the regular newsletter deliverers who had saved FHP £2k in postage but asked for further volunteers. All existing trustees were re-elected with the exception of Treasurer, Carron Batt, who no longer wished to stand due to frequent travel. Mrs Batt was thanked for her work with The Friends and members were invited to put forward names of people suitable to fulfil the role of Treasurer. Jennie Kettlewell was elected as Chairman of The Friends. Roger Foreman was elected as the Independent Examiner and Leslie Du Cane was thanked for the work he had done previously in that role. Jennie Kettlewell presented the Chairman’s Outlook for the coming year and said plans fell into three categories; building developments, funding and events. Building developments: As a result of The Friends’ strong objection to the Opera’s revised application for closure of the terrace for a full eight months, planning consent was reduced to 6½ months – a gratifying outcome, given the original request for 12 months. Performances may not start prior to 31 May or continue after 31 August; erection of the canopy may not start prior to 13 March. The canopy and all materials must be off site and the site cleaned up by 30 September at latest. The decision is now made, final and we should accept it with dignity. The Friends are liaising with the Council and the developers to establish and influence the impact of the new Design Museum on the site of the Commonwealth Institute, in particular, deployment of the Section 106 Agreement for £100k. The new Ecology Centre is due for completion in early autumn. Funding: For a second year Ecology Centre events will be funded by The Friends, which we know results in higher attendance. Three funding projects are being progressed – repair or replacement of the non-functioning fountain outside the Stable Yard, carved gates for the Wildlife Enclosure designed to be attractive and improve security, and a replacement for the sculpture stolen from the Suntrap Garden. The committee is seeking significantly large projects for full or seed funding to ensure the Park benefits from the current high level of assets. The newsletter is now produced in full colour throughout in order to do justice to photographs and illustrations. Events: The art exhibition has been rejuvenated by Gordon French; sponsorship from Killik & Co allowed additional promotion; a display of pictures by Sir Hugh Casson celebrated a past president of The Friends and the smartened catalogue is now free to visitors. Planned events include the annual Virtuosi concert, Pimm’s party and Tallis Christmas concert. The autumn talk will take account of members’ preferences based on a survey. There were questions and answers about the opera canopy, pigs in the park, cafeteria portions, pigeon feeding and dog mess. Sir Angus Stirling closed the meeting at 8.40 p.m. Given to us at the beginning of this amusing and fascinating talk by Dr Leslie Mitchell on 21 February was a sketchy family tree, but one with a difference: it was mainly to show various love relationships, with a continuous line drawn between spouses and a dotted one between lovers. But then the spouses were usually lovers too. For example, Lord Edward Fitzgerald, who led the Irish Uprising and was shot as a traitor in 1798, was Mrs Sheridan’s lover, and his wife Pamela was Sheridan’s mistress. Very convenient. By the way, the aforesaid Lord was cousin to Charles James Fox (Georgiana, Duchess of Devonshire’s lover), brother of Stephen, the 2nd Lord Holland. But the main topic of the talk was Henry Fox, 3rd Baron Holland, or rather his wife, Elizabeth, Lady Webster, with whom he fell in love and had an illegitimate son (who therefore could not inherit the title) before Elizabeth could divorce her first husband (by whom she had had three children whom she detested and rarely saw). Charles, the illegitimate son, married Mary FitzClarence, illegitimate daughter of William IV and his actress mistress, Mrs Jordan. And so it goes on. There were fewer than 150 divorces in the whole of the 18th century; divorced ladies were ranked with scarlet women. Elizabeth, Lady Holland, heiress to two sugar estates in Jamaica (and later a passionate abolitionist), did not care, nor did she care that she was never presented at court; why should she? Her salon at Holland House in the years 1797 to 1840 was the talk of London and a magnet to politicians, ambassadors, artists, writers, travellers and refugees; very often foreign ones came to stay. All her servants were from overseas; one particularly handsome one washed her feet in public on one occasion. This was considered shockingly ‘foreign’. Up to this time a salon was considered a profoundly foreign thing – mostly French. A woman holding sway over one had to be strong-willed and of exceptional character. The 3rd Lord Holland’s wife fitted the bill and was considered so terrifying by some – ‘the only real despotism in Europe’ – that chemists sold pills to people about to dine at Holland House. Dinners took place two to three times a week when parliament was sitting. In the summer the Hollands went abroad: they hated hunting and the real countryside. The lady of a salon also had to have money – to pay for the entertainment; this lady had the slave sugar money. A salon also needed a menu, and in this case it was politics – provided by her husband. Lady Holland respected her much less forceful husband; nevertheless she was capable of treating him quite summarily: in later life he was in a wheelchair, and if she got irritated by his presence at her gatherings she would simply have him wheeled away. He seemed to take it in good part. Charles James Fox had dominated Whig politics until his death in 1806 when he handed the Foxite agenda to his favourite nephew, the 3rd Baron Holland. Tories were not invited to Holland House: the Foxites thought them far too dull. All statistics and no jokes. They also thought that England was threatened by despotic kings, especially German ones like the Hanoverian Georges (they did think Queen Victoria was all right until the ‘dreadful’ Prince Albert came along). Lord and Lady Holland had travelled abroad from 1791 to 1796 and came to know a lot about foreign affairs. After the Napoleonic years Lady Holland held a salon in Paris whenever they went there. They both spoke French, Italian, Spanish and Portuguese, and often interfered with European politics, for example sending a suggested constitution to Joseph Bonaparte and advice on how to rule over Naples; or sending a manual to the Spanish on how to run a government. The Spanish politely pretended to be grateful. The Foreign Office threatened to confiscate their passports for meddling. Napoleon was a problem for the Hollands: they had to make terrible choices. They admired him enough to have his bust erected in the House grounds and, when he was exiled, the Governor of St Helena was invited to the House. Subsequently Lady Holland was permitted to send Napoleon clean shirts, ice-making machines and other luxuries. When he died he left her a golden snuff box with a lock of his hair. Another group of diners were the Scots. From 1789 to 1815 many Whigs thought the European Grand Tour to be dangerous: Bonaparte was locking up British travellers. And now young Whigs were often educated in Edinburgh and Glasgow rather than Oxford or Cambridge. In 1802 the Edinburgh Review, which discussed serious books at great length, was launched. Any intellectual worth his salt had to subscribe. Lady Holland invited the writers to the House and promoted them; the Review was ‘The March of Minds’, ‘The Movement’. Suddenly the world was thousands of years old instead of just six; civilisation was progressing in huge strides, and Britain was ahead of the field. Although she bullied him, Lady Holland was devoted to her husband and was devastated by his death in 1840. She no longer had the heart to continue with her regular dinners, and rarely stayed at the House. She preferred to live in her house in South Street and frequently invited herself to other people’s houses where she sometimes proved a rather difficult house guest. The Edinburgh Review wrote a eulogy to Holland House when it was shut up by Lady Holland in 1843. Nine months after her death in 1845, the 4th Baron Holland, her son Henry Edward Fox, returned from Florence and took over the running of the House. There is nothing in the rule book saying AGMs have to be dry, dusty events, and ours are certainly not. Although they have a formal structure, they are always interesting and amusing, and even the most ardent readers of the newsletter will learn something new and topical about our lovely park. Chaired by our distinguished president, Sir Angus Stirling, this yearly occasion gives members the chance to hear what your trustees have been doing in the last year and to learn what can be expected in the current year. Most importantly, it is also your opportunity to tell them of any particular concerns you have for the park and its management. As usual, the AGM takes place during our annual art exhibition in the Orangery, which this year will be even better than usual, and after the meeting is a great time to view the exhibits over a glass or two of wine. Please do come and support your trustees, who work hard on your behalf all year. Our talented Friends, Natalia Lomeiko, Violin, and Yuri Zhislin, Violin and Viola, both Professors at the Royal Academy of Music, will once again perform for us. They have played in every major venue in this country, and Yuri claims to have performed in 60 different countries. No one who has heard them will forget their combination of energy, discipline and passion. This time they are again bringing with them the cellist Richard Harwood whom The Strad hailed as ‘probably the greatest young cello talent since Jacqueline du Pré’. He has just returned from playing for the Sultan of Muscat where he performed, as always, on his instrument of 1692 by Francesco Rugeri. They will play for us Beethoven’s String Trio in G, Op.9 No.1 and Ysaye’s Sonata for two violins. Yuri and Natalia have just recorded this and will bring some copies for sale, if already available. After the concert the audience will have a chance to talk to the artists over wine and crisps. Please order your tickets now at £15 on the order form. We are pleased to tell you that the trustees have co-opted Jennie Kettlewell as chairman of the committee, following her expressed wish to stand for that office at the AGM on 20 March. Jennie has lived in Holland Park for almost 30 years, been an FHP member for many years and served on the committee since September 2011. She is very familiar with the park, its assets and particularly its plants. Her FHP experience means she knows how the committee functions and what the role of chairman entails. • and she is also experienced in individual and team development. Much of her learning comes from being an interviewer for the Institute of Directors chartered director programme. Through this, she builds knowledge of what organisations do that makes them successful. Jennie told us she considered standing for chairman when the role was first vacant a year ago, but did not feel she then had sufficient understanding of The Friends' remit or the context in which it operates. She says she feels better fitted now, but is well aware she will continue to learn. We are very grateful to her for standing and the trustees warmly commend her to you to be our new chairman. At the AGM we will propose Jennie as chairman and feel sure this will be endorsed by members. There was the biggest audience that I can recall in the Orangery for the thirteenth visit by the Tallis Chamber Choir and their conductor, Philip Simms. Once again Philip Simms had devised a remarkably varied programme with carols from France, Germany, The Netherlands, Italy, Spain and the United States as well as the United Kingdom. We began with Torches and There is no rose of such virtue (the former based on a Galician carol), composed in the early 1950s, the two most popular works of the South-African-born composer John Joubert (b. 1927). We then had a piece by Giovanni Gabrieli (c. 1555-1612), the Venetian composer, composed specifically for Christmas in St Mark’s, Venice; although there were only 18 singers in the choir, they sang this eight-part piece with a wonderful richness. There followed a traditional Sicilian carol, Quando nascette Ninno (When the babe was born), known as the bagpiper’s carol, which might have inspired ‘He shall feed his flock’ in Handel’s Messiah, as the melodies are very similar. We finished the first half with Bogoroditsye Devo (Rejoice, O Virgin) from Rachmaninov’s All Night Vigil composed in 1915, which included three different kinds of chant; this created a wonderful atmosphere perhaps never experienced in the Orangery before. We began the second half with Ecce virgo concipiet by the Dutch composer J.P. Sweelinck (1562-1621). We then had Away in a manger in a version based on a traditional Normandy tune, arranged by the conductor Reginald Jacques (1894-1969). The tune is delightful, and it made a change from the more familiar one. We now came closer to the present day with Winter Wonderland written in 1934 by Felix Bernard (1897-1944), an American who wrote popular songs for many well known American singers. We were still in the US for Santa Claus is coming to town, originally composed by J. Fred Coots and Haven Gillespie, also in 1934, but in an arrangement by the English composer, Peter Gritton. The choir finished with the Donkey Carol composed in 1975 by John Rutter (b. 1945), who also wrote the poetic text, this being the donkey’s account of the journey to Bethlehem, and the nativity. The audience sang lustily in four carols, and there were six readings by members of the choir, three of them by Dylan Thomas describing his own childhood Christmases. After the delicious food provided by Janice Miles we went home having had a wonderful evening and a splendid introduction to Christmas. We give our thanks to Philip Simms and the choir for a great evening and, as I have said before, we hope that they keep coming back. We have received a legacy of £25,000 from the estate of Anthony James Longworth. This is the largest gift we have ever received and we wish we had known about it in time to thank the donor. We are sorry to report that our Chairman, Stewart Katz, has had to relinquish the role of Chairman of The Friends due to increased workload from his own business. This has been entirely unforeseen, although he has always been clear that his clients must come first and feels he must now focus on this unanticipated additional client work. We thank Stewart for taking on the role of Chairman with all good intention and both parties are sad that it has not worked out.